Top quality Calligraphy Fountain Pen with 3 calligraphy nibs comes in a beautiful storage tin. Beginning set with six nibs. Calligraphy Mini Kit, Assorted Colors A No-Nonsense calligraphy pen with three italic nibs in fine, medium and broad and four Skrip ink cartridges in blue, black, red and green. Instruction booklet included. Made in the USA. 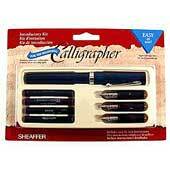 SHEAFFER writing instruments are designed to perform at their best using genuine Sheaffer® inks and refill systems. These specially formulated refills and inks will ensure a long write life and smooth flow of ink to paper. 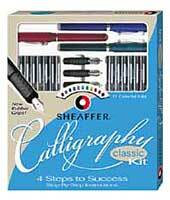 Sheaffer Pen  the manufacturer's web site  a division of BIC USA Inc.
MisterArt.com: The world's largest online discount art supply store!  Go to MisterArt.com and earn cash today!!! PLEASE NOTE This web site is not affiliated with the SHEAFFER pen company or the BIC group in any way.This is an independent site containing information about pens and calligraphy tools. All images, characters, logos and trademarks are property of their respective owners and are used here either with permission or in an editorial fashion only. Content on this site is ©1999-2005 BLAM®. Hans Presto is a Swedish lettering-artist and art-teacher. BLAM design supplies new and vintage steel pen nibs (pen points) to Scandinavian cartoonists , calligraphers and collectors.